At its Woodland, CA field days, Sakata Seed America mainly showed field crops including melons, watermelons, beets and squash. However, a section of the field was dedicated to a greenhouse where customers were able to see the company’s specialty tomatoes. 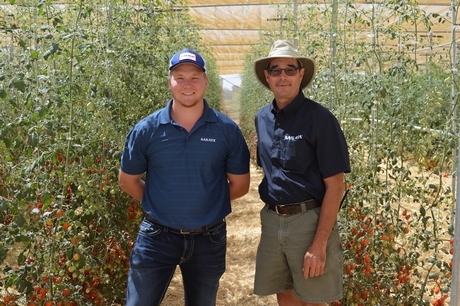 “We’ve been breeding tomatoes for the North American market for fifteen years,” says Tyler Hoopes with Sakata Seed. “Within the tomato category, specialty tomatoes are our focus, including grapes and a variety of medley tomatoes.” The seed company sells more than 50 commercial specialty tomato varieties and has hundreds of other varieties in development. Tyler Hoopes and Dennis Thome with Sakata Seed America. “The focus on specialty tomatoes is driven by our Japanese heritage,” says Dennis Thome with Sakata Seed. “The Japanese have an above average preference for specialty tomatoes and flavor is a really important focus,” he added. “It drives our greenhouse specialty tomato business.” The Japanese taste Sakata Seed focuses on is referred to as ‘umami flavor’, which incorporates the unique and superior flavor profile of the company’s specialty tomatoes. 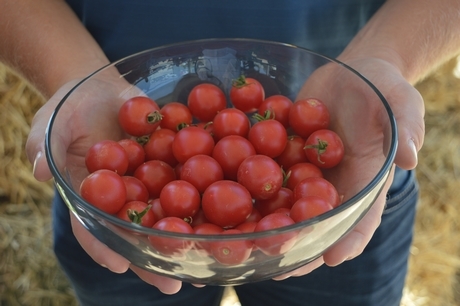 The Fonzi’s Pinky is one of Sakata's newest specialty tomato varieties. With so many different tomato varieties being available, growers as well as retailers prefer a unique product that sets them apart from others. “It is our role as relationship managers to discuss with our customers what characteristics they are looking for in a specialty tomato. The information we receive from them is being shared with the breeders and it’s our goal to offer them a product that meets their requirements,” Thome mentioned. Some varieties are exclusive to one grower, but Sakata Seed also offers open varieties. New lemon yellow and brown grape tomatoes that will be launched commercially next year. 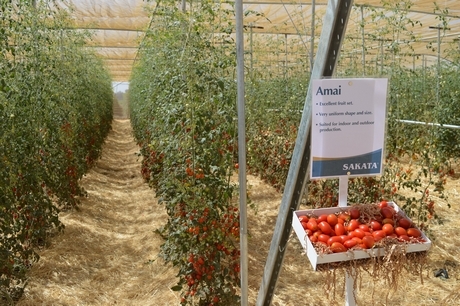 Sakata has specialty tomato breeding locations in Japan, the Netherlands as well as Spain. For more details on Sakata’s tomato varieties and availability, click here for the brand-new Specialty Tomato guide.